One (very big) reason we homeschool is because homeschooling provides a way to completely customize our children’s education. 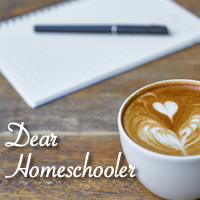 Therefore, a day in the life of two homeschoolers, no matter how similar, will always be a little different, as each aspect is tailored to meet the needs and interests of each child. Ah, the beauty of homeschool…. Thus, your day should reflect you and your students. You put a lot of thought into which curriculum works best for your teaching style and your student’s learning style. You set up your classroom and create the a learning environment that best suits your family. You work hard to create and adjust your lesson plans to fit the needs of your student(s). Likewise, you need to organize your day, so you and your students can make the most of it. Does your child work better in the morning or afternoon? Some students work better in the mornings. Others work better if they sleep in and start a little later. Are some subjects more challenging than others? I find that doing the least favored subject first (or earlier in the schedule) and getting it out of the way may help your student ‘relax’ into his learning. Consider doing the subjects that require more time/focus earlier in the day while your student’s mind is fresh and focus is sharp. Do you have more than one student? Try arranging one student’s lecture time while others are busy doing independent work or workbooks/workbuckets. Many home educators teach all their student’s the same subject matter in areas of Science or History and differentiate lesson requirements according to age/grade. What are your state requirements for attendance? Some states have an hourly per day requirement. For example, in Colorado each school day has to be a minimum of 4 hours. As I’ve mentioned, I am Super Organizer. I love schedules, data sheets, and planners. In order to make sure I get to everything, I schedule each school day by 15 minute increments, keeping an open mind to take advantage of spontaneous learning opportunities when they arise. I create a master week-long schedule that I follow all year and adjust each week as needed. To download the free schedule, click here. For those of you who shy away from schedules, you can still have organization in your school day. You may just have a checklist of lessons you aim to complete that day or week. You may order them or not, but you will know at the end of the day if you completed what you set out to. If a checklist is still not your thing, then gather today’s materials/lessons on the table in a ‘to do’ pile and just work your way through it.